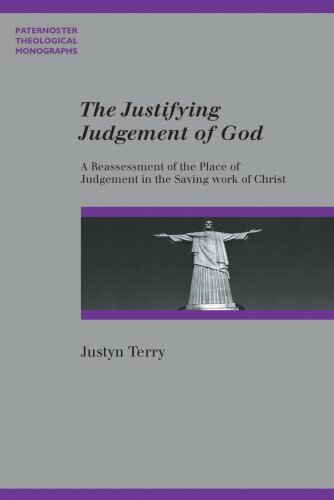 Over at Theology Forum, James has posted the first of what will be a series of reflections on Justyn Terry’s book, The Justifying Judgement of God. I plan to engage a fair bit in my thesis with Terry’s book so I’ll leave much of what I have to say about it to there. But I would like to say a few things about this book all the same; though more as a brief reaction than a review. Terry’s thesis is well written, and any study that takes on both Forsyth (even though I found his reading of Forsyth unconvincing and distorting at some junctures) and Barth (he does a much fairer job with KB) in the one book is going to be worth reading. Moreover, he is undoubtedly saying some very important things that are – in light of many contemporary attitudes towards God’s judicial work – things that the Church certainly needs to hear and, in some circles, recover as part of its witness to the cross. For this, we are in his debt. But his conviction that judgement is ‘the paradigmatic metaphor’ of the atonement is problematic. Here he trods very close (perhaps too close at points) to the same trap as those who are trying to suggest that penal substitution is the totus of the atonement. (I have posted on this here, here, here and here). He is careful, however, to maintain an important – crucial in fact! – distinction between ‘metaphors’ and ‘theories’, and does so while arguing that judgement is the co-ordinating metaphor. One of the unfortunate aspects of Terry’s thesis is that such a move threatens to undermine the forward-looking elements of the atonement in favour of predominantly backward-looking ones. By making judgement the key metaphor, Terry then has to proceed to find a way of accounting for the human response to Christ’s saving work, an account which is then fundamentally a separate work. Forsyth, on the other hand (and we could add Calvin, Mozley, Barth, TF Torrance, JB Torrance, Tom Smail, and others), by interpreting the proper human response to have already been offered by Christ in the two-fold movement of his cross – a response in which we participate – keeps the unique act of the atonement and its subsequent action in the life of God’s people grounded firmly in the one person and action of Jesus Christ and so bears witness that from first to last grace is grace and that grace’s name in Jesus Christ. With that whinge off my hairy chest, let me affirm that the book is certainly worth reading, and there is not a little therein to serve as the basis for some very worthwhile discussion. I’m glad you enjoyed the post. I’ll be interested in hearing your comments as the posts develop. Best wishes. Thank you for your comments on my book. It is helpful to hear the feedback and I understand your reservations. On the question of the future-looking aspect of atonement, I accept this does not get much air-time in the book, but would point to the gift of the Spirit, made possible because Christ has been glorified on the cross, in that regard, and to the coming judgement of Jesus Christ as the last day. I hope that is of some help. Do let me know if I can be of any assistance with your project.